Describe engagement program best practices. Describe various engagement program strategies to use in given scenarios. Few features of marketing automation capture the platform's simplicity and power as well as automated lead nurturing. But with so many uses for nurturing programs and different audiences covered, it can be hard to keep track of the types of emails you should send, when you should send them, the appropriate tone to use—well, you get the idea. That’s where we come in! We wrap up this module by running through some Engagement Studio best practices so you can confidently use the tool. We also review several use cases so you become familiar with its flexibility. You can easily use Engagement Studio for a variety of business strategies both internal and external. As you’re sketching out your lead nurturing strategy, take time to consider how to treat different types of prospect responses to your content. Some activities are much more indicative of buying interest than others. Consider the following activities: a form submission, an email link click, and email open. If you rank these activities in order of prospect interest and prospect value, you’d get the following. When Pardot gets more valuable responses, you’ll want it to add points to the prospect’s score, assign them to sales, or send them further targeted content. When Pardot sees prospects who display minimal interest and less valuable responses, you’ll want it to continue to nurture them inside the program until they begin to show more interest. Pardot offers you two ways to customize your content based on the recipient. Variable tags let you personalize text based on a prospect’s field values. You can turn any field in Pardot into a variable tag. Common and familiar places to use variable tags are First Name, Company Name, and Mailing Address. 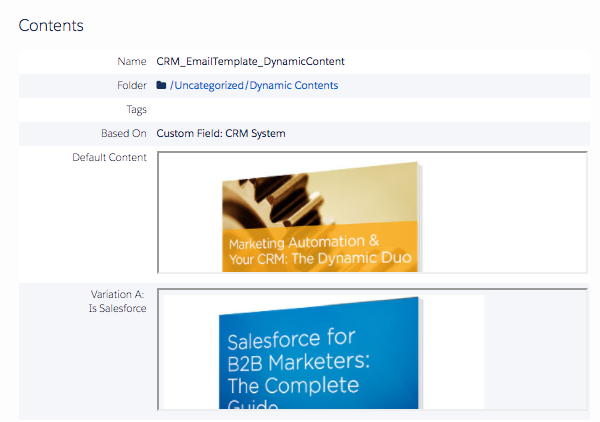 Dynamic content can be text or images that Pardot adds to emails and email templates. Pardot will check a prospect’s record for a specified field value, and then adjust what the prospect sees. In the example below, the dynamic content variation is based on the custom field CRM System. 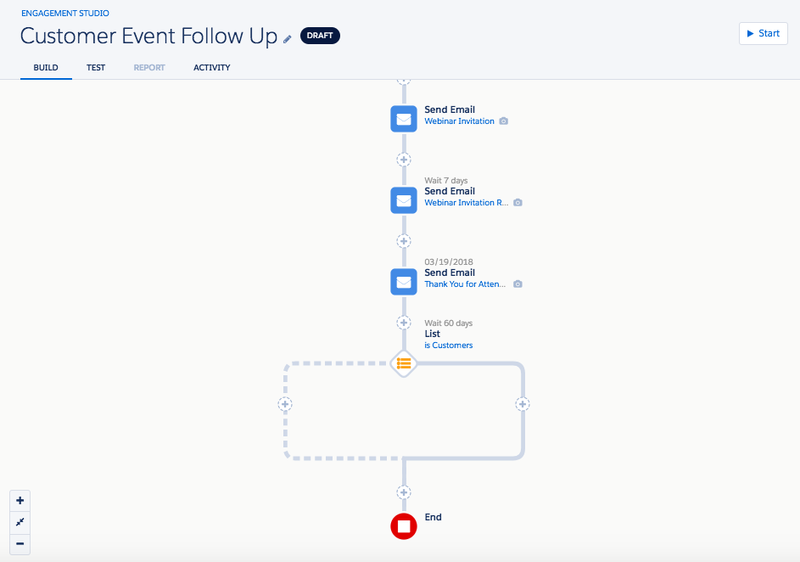 When you schedule email sends, you can handle all your pre- and post-event communications within the same program. Simply schedule an event invitation and reminders in Engagement Studio, and then, based on attendance data, target your attendees and no-shows with either thank you content or information about other events that they might be more interested in. Remember the end step type we described earlier? Placing it on a logic path inside an engagement program creates a permanent stopping point. Once a prospect reaches the end step, they will never progress further in the program, even if you build out more steps. 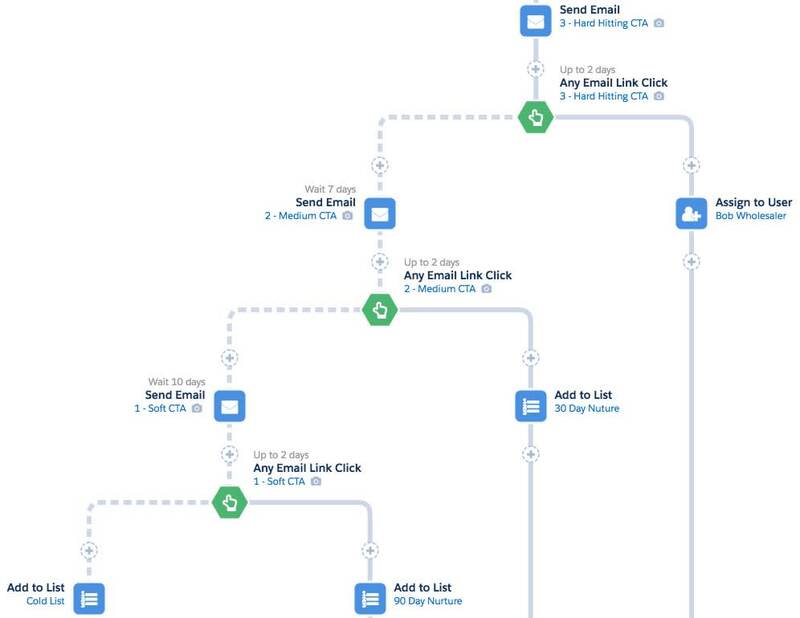 However, if prospects are on the end node at the end of a branch, and you delete the entire branch, then Pardot will automatically place the prospects (including the prospects on the end node) the other side of the rule or trigger. So, if you’re building out a program that you believe you’ll want to add onto in the future, include a long wait step right before the end that acts as a buffer. This will hold prospects on the last step for a while before allowing them to hit your end point. Lead nurturing is not only a powerful tool for sales and marketing, but also for your customer service team. Let’s look at two campaigns you can run that cover the length of the entire customer lifecycle, from initial awareness to a loyal (and hopefully repeat) customer. There are three prospect stages in stage-based marketing. Cold: Prospects don’t know they have a problem that you can solve. They need to be educated about why they should consider spending money with anyone, let alone you. Warm: They know they have a problem your service might solve. They need to be nurtured on a frequent cadence to get them to be hot. Hot: These prospects are ready to buy and should talk to sales. A 3-2-1 nurture program inverts the traditional marketing wisdom of marketing to cold leads first. Instead, you follow up with your hot leads first, ensuring that both their time and your time is used wisely. You quickly get them ready for sales, and then move on to preparing your warm leads in the same way, leaving the cold leads for last. Here’s an overview of what happened in the above program. Send the first email, 3 – Hard Hitting CTA, targeted to hot leads. This email focuses on the product purchase and offers prospects a time to connect with a sales rep. Wait a short period (for example, 7 days). Send a follow up email, 2 – Medium CTA, targeted to warm leads. This email provides some thought leadership on your service (say, the importance of your value proposition). Wait a slightly longer period (10 days). Send a follow-up email, 1 – Soft CTA, targeted to cold leads. This email helps potential leads understand that they have a problem that you can solve. If they reach the bottom without ever clicking a link, you know they are not ready to engage. Put them on a cold leads list, and follow up at a much later date. By using the 3-2-1 strategy, you can quickly identify your sales-ready prospects without sacrificing the ability to nurture your warm and cold prospects. This quick identification helps you rapidly convert more marketing-qualified leads and increase the opportunities that your marketing team is responsible for. Onboarding a new client will always be a high-touch, manual process, and rightly so. However, nurturing campaigns allow you to automate some of the more repetitive tasks involved in onboarding. These can include providing introductory training resources, a list of next steps after close, timelines for product kickoffs, and frequently asked questions. These helpful resources can help your new clients get started on their own, without having to wait on a customer service rep for assistance. Renewal nurture programs can be a convenient way to remind your existing customers that it is time to renew their contracts. 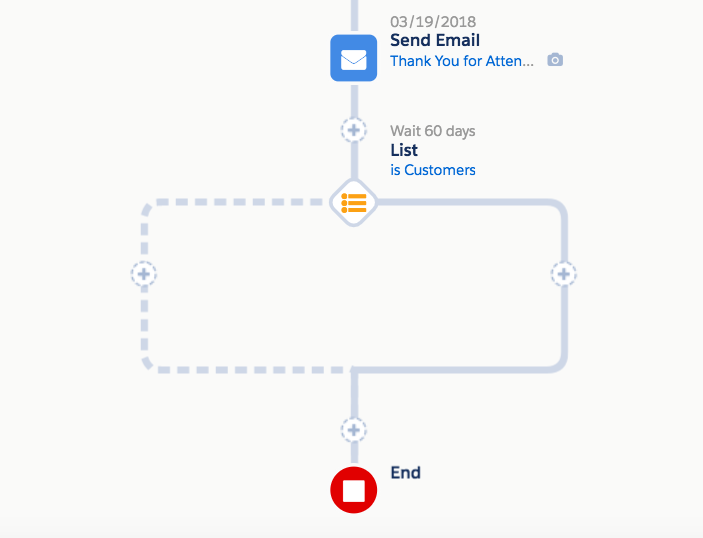 Using Engagement Studio, you can set this program to trigger a month (or more) before the renewal date, send multiple reminder emails over a specified period of time, and notify the assigned account manager if no action takes place. Renewal nurture programs make it far less likely that your clients miss the renewals on their contracts, and take the tedium out of the process for your service reps.
For more examples of lead nurturing campaigns using Engagement Studio, see The Complete Guide to Lead Nurturing. You’ve just learned how to create engagement programs that do the work of nurturing your leads for you in Pardot. Now you’re ready to start building more complex engagement programs by creating a strategy for your account.